Whether your older feline has been part of your family for life or is a more recent adoption, chances are you're fairly attached to your purring friend. While cats do tend to have fewer health problems than dogs, once they get to be senior or geriatric cats they need more frequent veterinary visits, dietary changes and sometimes modifications to their living environments. 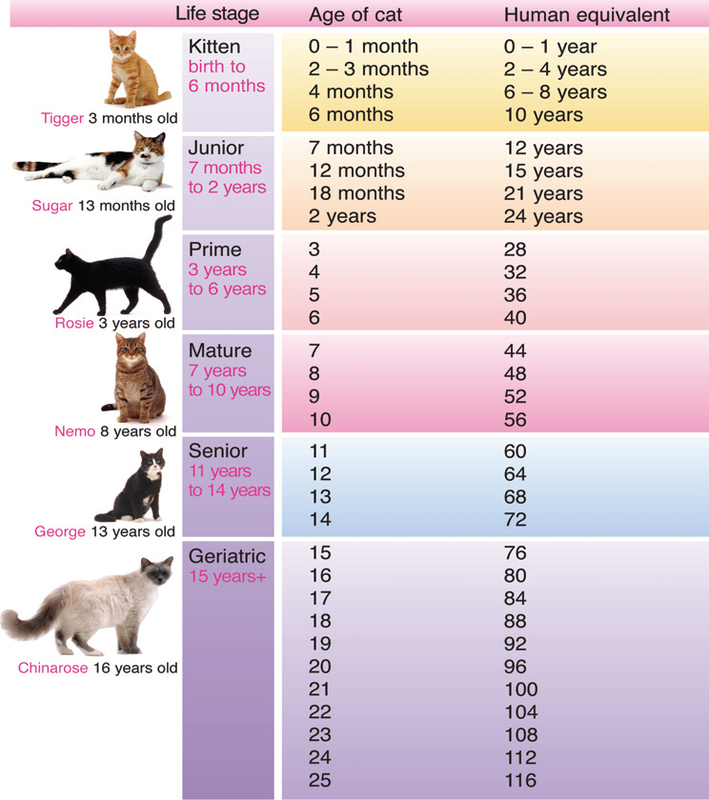 The following is an explanation of how older cat ages compare to human ages, along with tips on how to better care for your maturing lap-warmer. Cat Ages, How Old is Old? An 11-year-old cat is just pushing 60 in human years, the beginning of his senior years. By the time your cat is 15, he's well into his 70s and a confirmed geriatric. Indoor cats live longer, and it's not unusual to see cats live into their 20s. For example, a 22-year-old cat is over 100 in human years. As long as they are healthy and happy, geriatric cats can enjoy their old age. Since cats are smaller than most dogs, their joints don't have to manage as much weight and they aren't as prone to arthritis. Cats can gain weight in their older years, especially those that started out as couch-potatoes in their youth. Cats that gain too much weight are prone to diabetes and other diseases. Encourage your cat to play. Sometimes it takes a lot of wiggling that toy mouse or bit of string, but keep at it and the instinct to hunt will take over. Once your cat starts moving regularly, he'll lose the weight and begin to enjoy playing again. Cats have far fewer taste buds than humans. What we may perceive as being finicky might just be the cat letting you know his food is boring. Senior cat food formulas seem to taste better to most older cats, but you might have to try a few brands before he's happy. You might consider feeding more wet food, both for the additional water content and because it is more easily digested. Check with your veterinarian before you make changes in your cat's diet, especially if your cat is overweight or has a chronic health issue. Older cats may also have dental problems, making it more difficult to eat dry food. Your veterinarian can help you address this issue as well. Grooming sessions with your cat not only help keep his fur in shape, they are a bonding exercise. As cats age, it might be more difficult for them to self-groom, especially if they are overweight. Besides, the more fur you catch in the grooming comb or brush, the fewer hairballs you'll find on your floors. Long-haired cats in particular are prone to throwing up these wads of fur. Older cats sometimes find it more difficult to jump up on higher surfaces. If you have a cat tree with the kitty bed near the top, you might want to change it out for one with a napping spot closer to the bottom. A better idea is to have multiple beds at different levels. This encourages cats to exercise. They instinctively want to get as high as possible and on some days they might manage the higher jumps, especially on a tiered cat tree. If your kitty likes to sleep on your bed, but seems to need help up, build a ramp or a set of stairs. Your geriatric pillow with legs will thank you, loudly, usually while trying to "share" your pillow. The best thing you can do for your aging cat is to develop a good relationship with your local veterinarian. With both of you watching for signs of illness or stress, you can keep your aging feline happy and healthy for as long as possible.